Prolific slot developer IGT has long been a favourite of mine when it comes to online slots. I can count the likes of the Egyptian-themed Cleopatra and the most recent Dungeons and Dragons release of Treasures of Icewind Dale as some of my all time beloved slots. However, their recent releases have not filled me with as much joy. This slot title of Cash Coaster has a lot of pressure riding on its shoulders because I could well banish IGT to my “repeatedly disappointed by...” pile along with the likes of developers including RTG and perennial under achievers Novomatic! Trust me, I don't want to carry out such a horrible deed but I really am starting to lose my patience with female-orientated slots from IGT. Not that there is anything wrong with female-orientated slots of course! 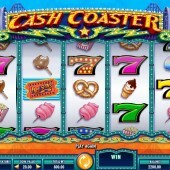 Cash Coaster is a 5 reel, 30 payline slot that does resemble a classic slot at first glance. The reels transport you to a Coney Island beach resort where the rollercoasters are fast, the candyfloss is sweet, and time stands still. Symbols on the reels include pretzels, ice cream, choc ices, candyfloss, popcorn, and the a load of 7 symbols that take the place of the standard regular symbols. There is also a Wild symbol and this substitutes for all other symbols except the Free Spins symbol to complete winning combinations. Interestingly, reels 1 and 5 can also turn completely Wild during the base game so that's a nice little feature to be aware of. The Free Spins symbol (or ticket as it is represented on this slot) is the key to triggering the free spins bonus round, obviously! You must hit three or more of these symbols across the reels to earn up to 6 free spins. When you trigger the free spins you will be asked to pick one of the ticket booths to reveal whether you earn 4, 5, or 6 free spins. During the free spins bonus round reels 1 and 5 will remain completely Wild giving ample opportunity to hit winning combinations. The Free Spins symbols will still appear during the free spins but the symbol will be a different colour. If you hit three or more of these symbols across the reels then you will earn up to another 6 free spins. 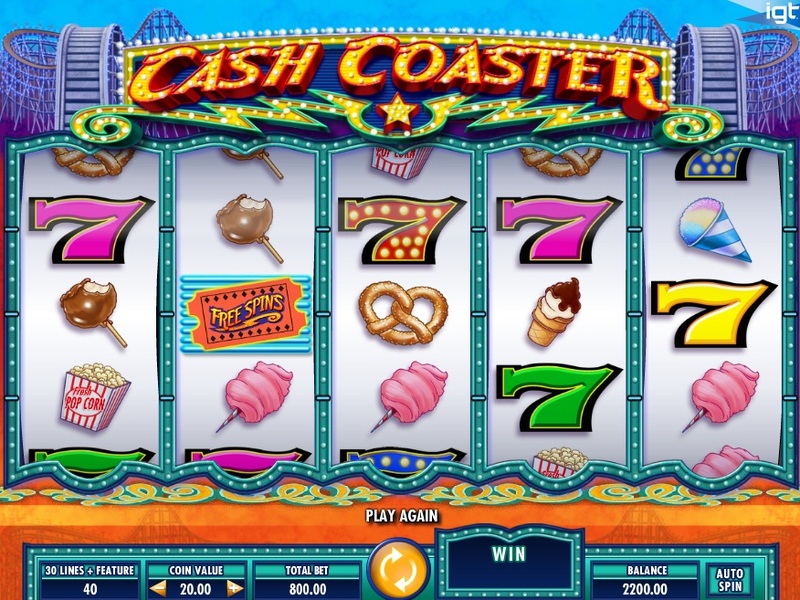 Cash Coaster is a slot that will take you back to your childhood where you would hit the seaside resorts with your family or friends and go to the amusement park located on the pier. This slot has a definite nostalgic feel to it and I have to say that it's a great little release by IGT for me. It isn't in line with the vibe they've had from previous release such as the cute and cuddly 100 Ladies slot or the Asian-themed Red Mansions slot but I prefer that to be honest. The free spins might not be in abundance but the ability to re-trigger them as well as having reels 1 and 5 completely Wild more than compensates. Bravo, IGT! I knew you wouldn't let me down!